It’s not surprising that we are seeing drones more often each day. As their technology and capabilities improve, they are being used for more neat jobs and really opening up a new world that we never thought possible. Not only are drones able to do more of the mundane work that humans no longer have to bother with, they are able to pull off some incredible light shows for our amusement. By simply creating a computer program, light shows that are performed by multiple drones in sequence are able to be accomplished. Flashing and changing lights, movement, and various flight patterns are all performed with just the touch of a button now. This eliminates teams of workers from having to carry heavy equipment and setup lights and cords for hours on end and really makes the process much more simplex and far more amazing. Intel has really created something that is surely to only get better as they continue to make advancements. After the astonishing light show at the Olympics, Intel was able to pull it off again and steal the show at Coachella. For the second year in a row, the drones were able to perform an incredible light show in front of a live audience. Intel anticipates that this technology will be used for entertainment as well as promotional purposes and looks at the sky like a giant dark canvas that’s just waiting to be lit up. In addition to Coachella and the Olympics, drone light shows have also been seen during the Super Bowl halftime show and on the Vegas strip for the Bellagio. With these shooting star drones weighing less than 12 ounces and a single show being started by one lone person in front of a computer that hits the “launch” button, there’s really no limitations on the amazing spectacles that we are sure to see in the future. 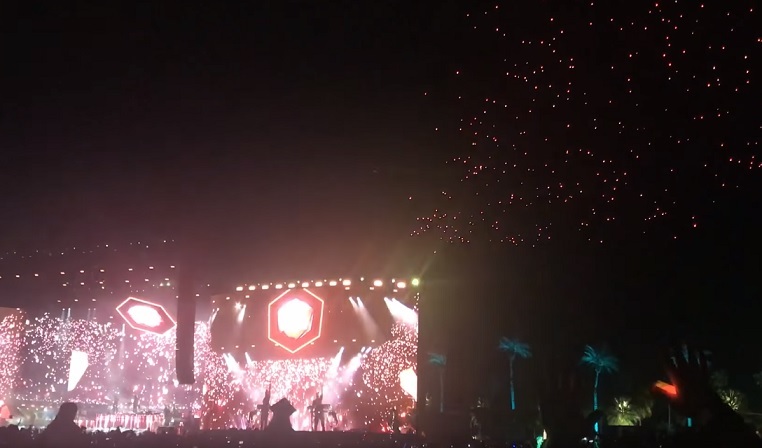 This show at Coachella featured 420 of the shooting star drones. These drones have the sole purpose of flying in these light shows. They aren’t used for anything other than that, like capturing photos or videos like other drones are typically used for. Each one of these drones are able to emit more than 4 billion colors. During this show, the drones were used for Odesza’s act to create their geometic logo above the stage during their performance. This is amazing. Israeli Technology at its best!!! !